Ahead of the launch of the Jaguar I-Pace electric sport utility vehicle here by the end of the year, Jaguar boasted the SUV’s outstanding driving range in the 378-kilometer drive from London to Belgian capital Brussels in September, the company said Wednesday. Powered by its advanced 90-kilowatt-hour lithium-ion battery, the I-Pace has a maximum driving distance of 480 kilometers per charge and driving stability in freezing weather conditions of minus 40 degrees Celsius. 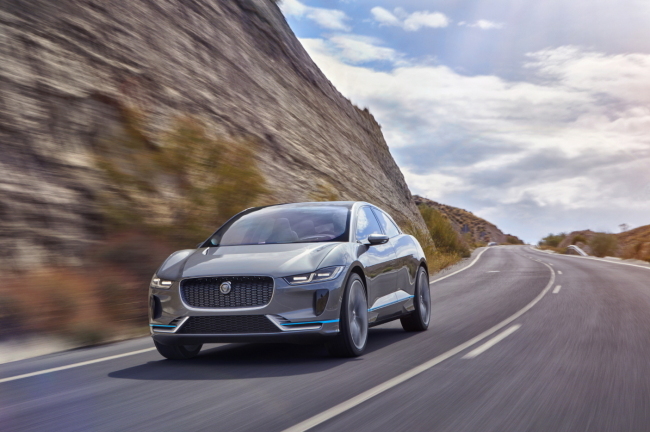 In partnership with Posco ICT, Jaguar Land Rover Korea plans to set up high speed electric vehicle chargers at its dealerships and service centers nationwide, which would be a first for the local auto industry, the carmaker said. Using a 100 kilowatt-hour direct current charger, it would take 40 minutes to achieve an 80 percent charge, or 90 minutes using current 50-kilowatt-hour chargers located at public charging stations here. Producing a maximum 400 horsepower and 71 kilogram-meters torque, I-Pace is equipped with two 35.5-kg-m torque electric motors, one in front and the other in the back of the car body, the company said. I-Pace is expected to come with a price tag of 104 million won ($92,000) for the EV400 SE, with the EV400 HSE at 124.7 million won and EV400 first edition at 128 million won, it added.